Sure-Block II Alkyd Stain Blocking Primer is formulated for use on both commercial and residential projects where the use of a stain blocking primer is required. Seal water, fire, and smoke damage to wood, walls, and plaster. Holds back tough stains including grease on bare or previously painted drywall, cured plaster, and woodwork. Use on metal (including aluminum, steel, and copper), vinyl, PVC, and masonry where stain blocking and adhesion are a concern. 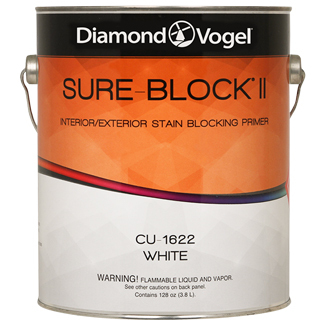 Sure-Block II is also suitable for use as an exterior wood primer to seal water-soluble tannin stains.